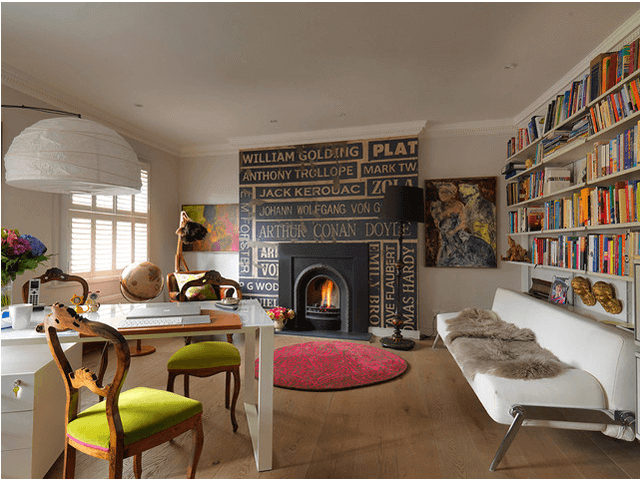 A fireplace can keep your home cosy and warm over the cold winter months – but from an interior design perspective, they do so much more, from adding old-fashioned charm to a contemporary twist. Whatever your taste, there are plenty of stylish fireplace designs to choose from. Don’t believe us? 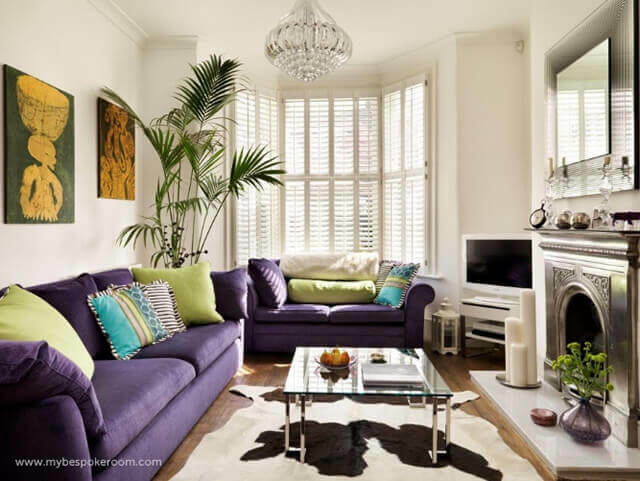 Here are six inspiring living room designs to get you started. Image and design by My Bespoke Room. This light and airy design demonstrates how the right fireplace can really brighten up a room. In the daytime, the fireplace reflects natural sunlight around the relatively small space, while at night it multiplies the flickering flames. You can get this effect with our cast iron combination fireplaces. Image by Simon Upton. Design by Paolo Moschino for Nicholas Haslam. While in many ways a formal living room, the red chairs and patterned rug add a touch of the eclectic to this space. 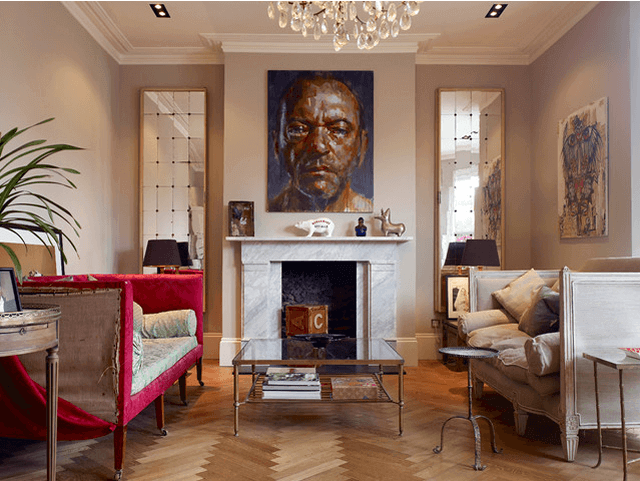 The period fireplace at its centre anchors the room by creating a strong sense of symmetry, which plays an essential role in holding the design together. Image and design by VSP Interiors. When asked to picture a fireplace, a lot of people envision a traditional dark wood or wrought iron design. 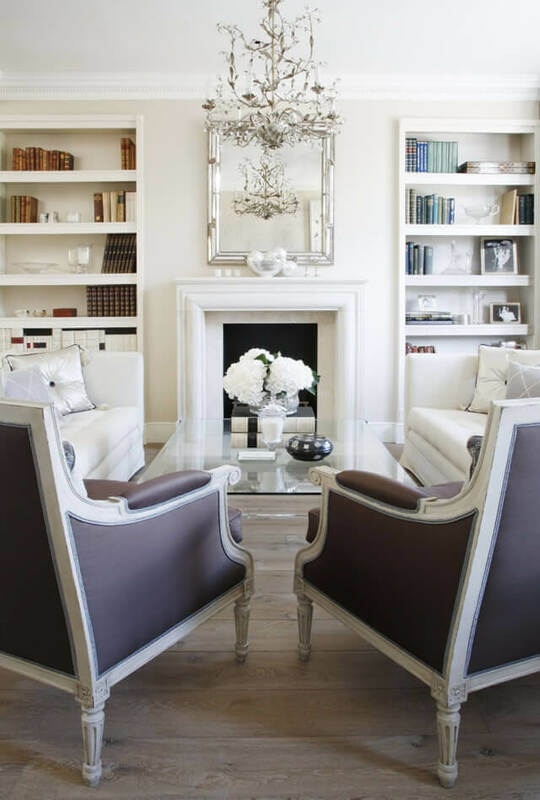 But, as this beautiful room shows, white fireplaces can add a contemporary touch to any room, keeping things clean and simple. You can get the look with our white Agean limestone fireplaces. Image and design by Mia Karlsson Interior Design. As this quirky interior design demonstrates, the addition of a fireplace can be the icing on the cake when it comes to statement walls. 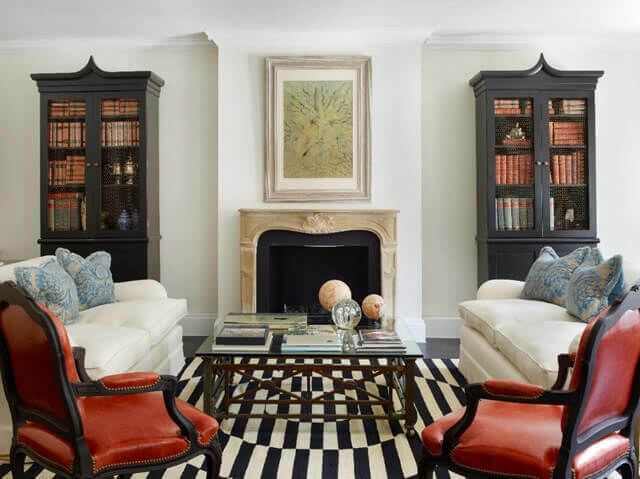 Here, the eye is immediately drawn to the bold black hearth and the authors’ names around it, firmly establishing this room as an inviting reading nook. Image and design by Inspired Interiors. 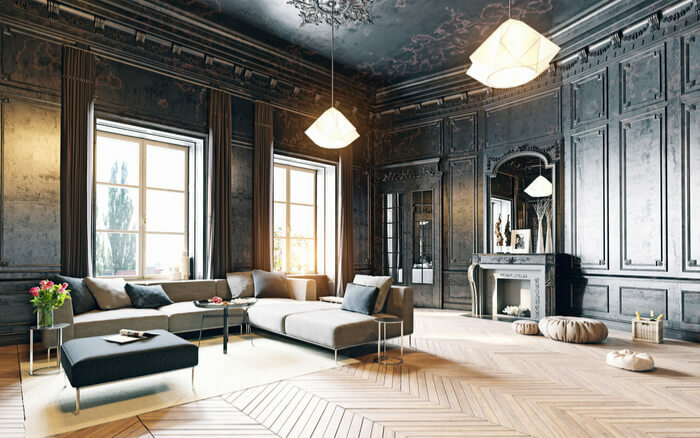 If your favourite interior designs centre on tones of black, white and grey, then you might want to consider black-and-white fireplace designs. The muted palette of the room really brings out the warmth of the flickering orange flames. You can get the look with our Agean Limestone Fire Surround and Cast Iron Fire Insert Packages. This eclectic living room is an art lover’s paradise, and the fireplace at its centre does not disappoint. Not only does it draw the eye to the large portrait directly above, but the mantelpiece serves as a shelf for the display of statuettes and other trinkets. Image by Kilian O’Sullivan. Design by Stiff and Trevellion. As these beautiful fireplace designs demonstrate, fireplaces can do much more than just keep a room cosy. Irrespective of a room’s style or size, you’ll never find yourself short of inspiring fireplace ideas. If you’re looking for your perfect fireplace, take a look at our range of fireplaces and fireplace surrounds today. Which Gas Fires Are The Most Efficient? 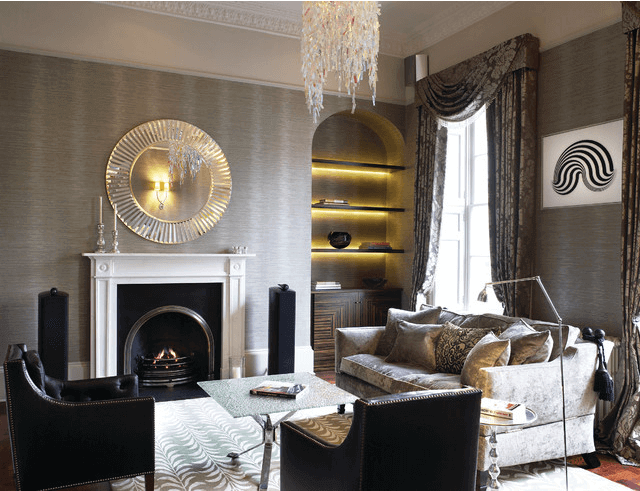 Direct Fireplaces is a specialist fireplace retailer, showcasing a stunning range of fireplaces and fireplace accessories. Whether your home is traditional or contemporary you'll find your perfect choice in our collection of limestone, wooden and marble fireplaces. Not only that we've also got a vast range of electric and gas fires, both modern and traditional to suit all homes.